One area of beauty I can never seem to get right and find the perfect products for is hair care. I absolutely love trying new hair products and seeing the results, but have rarely found a set of affordable products, which I want to repurchase again and again. Well... that was until I found these products! After the first few times of using them I found they made such a difference to my hair that I knew I needed to boast about them to you! 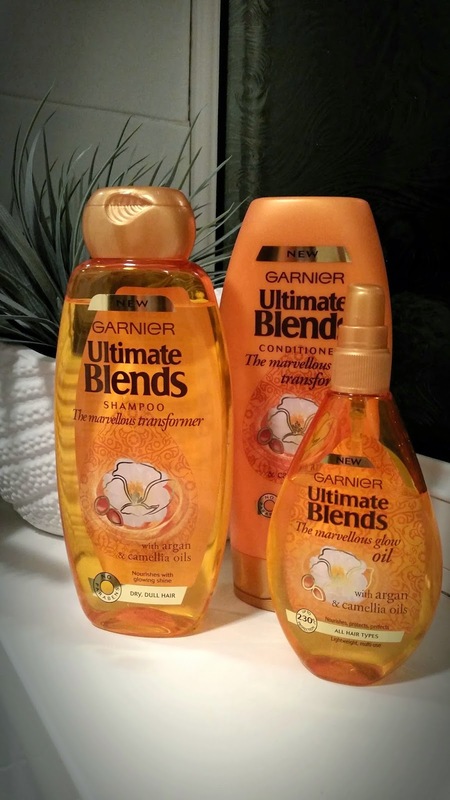 Garnier have brought out 6 different brands to the Ultimate Blends collection, each focussing on your hair type and what they aim to achieve. I chose The Marvellous Transformer for dry and dull hair. My hair has been exposed to a lot of heat throughout summer, which left it looking a little bit lifeless. So as soon as I seen that it contained argan and camellia oils AND left your hair with a 'glowing shine' I was almost running to the checkout to purchase this! Firstly I want to talk about the Shampoo and Conditioner, and the first point I must make is the fact that they smell amazing! leaving your hair with a crisp clean scent for days, without being overpowering. The formula lathers really nicely (which I love in a shampoo) and as for the conditioner it leaves your hair silky smooth and just as it says.. with a shine! Although one tip when using the conditioner, make sure you just use it on the area of the hair you feel is damaged, I run it through the ends of my hair, from about ear width down to the ends. I made the mistake the first few times of using it on the roots, but because it contains oils, it conditions very well and can leave your hair feeling deflated if you apply too much, which makes it hard to style. I purchased the oil at the same time as the shampoo and conditioner, I wanted to see how they worked together and since I always use an oil after washing my hair, this for me was basically a must. I love the fact it has a heat protection in and when adding it to damp hair the finishing result feels weightless and doesn't leave a greasy residue as some oils do. It also states you can use it on dry hair just on the ends for added shine and nourishment (for those bad hair days, I liked this idea!) However, I don't feel it works as well on dry hair. Overall, I definitely recommend these products! I have now re-purchased them for the second time and my hair has never felt better. I've also heard great reviews from family and friends which have also tried out other products in the range. Let me know if you've tried these products?